Ethical Society -- brochure with model. This image is taken from the fund-raising brochure publishing at the time. 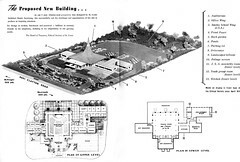 The building model is shown photographed in it's location on the site and the main level floor and lower level floor plans are illustrated.